Berry Family DNA Project, as well as the occasional social comment. 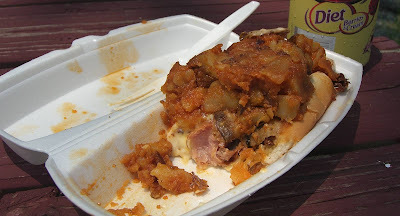 My son, Jon, likes to fancy himself the connoisseur of adventures gastronomique. I'm here to tell you that his claim is not only tenuous, but most certainly nonexclusive! His mom and I tend to plan our various sojourns so as to pass by certain venues at appropriate times for exploring their offerings. 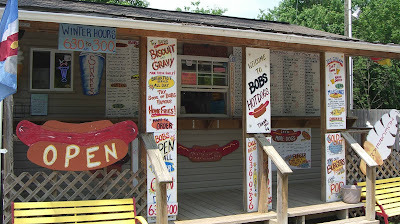 Our trip last Thursday from Winchester to Charleston, WV, was no exception and we arrived at Bob's Hot Dogs in Elkins, WV, at noontime. 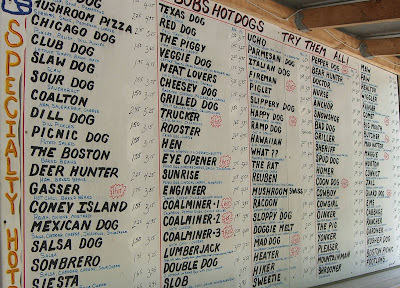 To discover a broad selection of delectible choices- I chose the mushroom swiss with homefries- Mm-m-m-m-m- Yes, there is a hotdog in there. Jon does have an advantage, though. He's still young enough not to be plagued with those dreaded 'senior moments'. As an example, on our return yesterday we stopped at The Donut Shop in Buckhannon, WV, for a maple donut and a pepperoni roll. Did I think to photograph and report on my treasures? Nope, sorry. I just enjoyed them. I'll try to remember to share with you the next time through. you can view any image at full size by clicking on it. I often have links embedded in the text, not always obvious. You should look for them. NOT optimized for Internet Explorer! Direct Project questions to Jim Berry or Carol Vass. Direct web site or blog questions to Jim Berry.